Кабел за субефер. Чиста, безкислородна, посребрена мед. Посребрени накрайници. Silver-plated conductors and FEP insulation mean that the Cobra VEE 3 will carry more information, more accurately. In listening tests it was easy to hear how the Cobra VEE 3 improved the dynamics and helped to define the start and finish of individual notes. This helps to bring life and articulation to soundtracks, particularly noticeable with music, be it background or otherwise. The Cobra VEE 3’s excellent shielding makes it a great choice for long runs to rear subwoofers. Even over shorter lengths the shielding will play a big part in performance, especially given the potential for interference caused by the number of power and signal cables around the back of a typical home cinema system. Cobra VEE 3 is similar in construction and configuration to Crimson VEE 3 but with a crucial and performance-improving difference. Cobra VEE 3 conductors are constructed from multi-stranded silver-plated oxygen free copper conductors and the conductors are insulated with FEP, a material with very similar performance characteristics to PTFE. This combination of materials is used extensively in Chord cable designs. We find that it improves signal transfer across a wide bandwidth, particularly noticeable at frequency extremes. The pseudo-balanced conductors are held in place with cotton spacers to reduce mechanical noise and protected with a dual layer high frequency effective foil and braid combination shield. The shielding is surrounded with a soft PVC to provide further mechanical damping and this is protected with a hard PVC outer jacket. 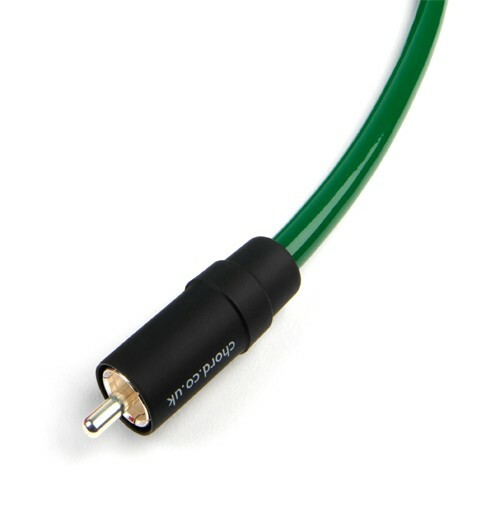 The Chord Cobra VEE 3 is fitted with Chord’s custom VEE 3 RCA plug. The ABS outer shell and the unique silver-plating process applied to the contact areas of the plug improve signal transfer across a wide frequency range. The signal return surround provides a secure high-pressure contact with all types of RCA sockets. The centre pin is insulated with PTFE and the design of the plug and ABS outer shell provides good strain relief without compressing the cable and compromising performance.